If this review is lame, blame it on the movie. You know, I thought Christmas was a time for joy. A time for enjoying oneself. A time when I wouldn’t have to review something god awful. But I guess if I only talked about GOOD things all month it’d get real repetitive real fast so, here’s the total opposite of that. 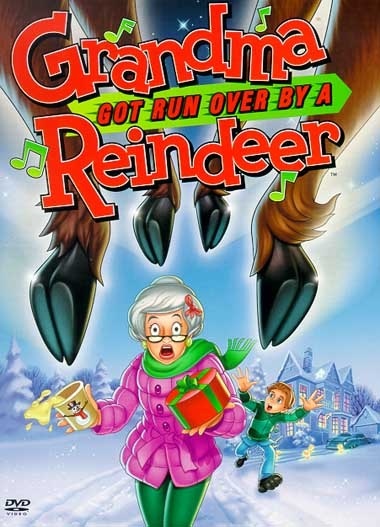 Unlike my last two subjects, ‘Grandma Got Run Over By a Reindeer’ is one that I’ve grown to dislike infinitely more since I first watched it all those years ago. Why exactly is that? And, more pressingly, why exactly am I even bothering? Well if Nostalgia Critic can review it, I say it’s fair game! Based on the novelty song by Elmo Shropshire, the special follows a boy named Jake, who surprise-surprise is going through the standard “is Santa Claus real” conflict. The only one who seems willing to affirm the Claus is Jake’s grandmother, who gets literally run over by Father Christmas that very night, before disappearing moments later. Jake is the only one there to witness this, and is of course laughed off by everyone else who assume. Grandma just got lost. 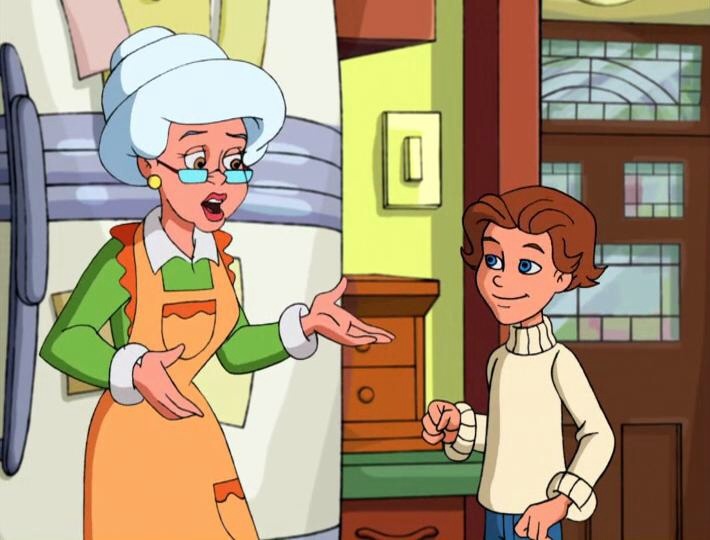 Grandma is proclaimed missing and eventually dead after months of searching bears no sign of her, while Jake’s scheming cousin Mel plots to sell off Grandma’s toy store in her absence. To set things right, Jake decides to track down Santa and bring his Grandmother back. Because I guess Santa just decided that keeping an old lady he injured with him for months was cool or whatever. Either that or whoever wrote this doesn’t know how time works. In case I had to spell it out, this movie is duuuuuuuuuuuuuuuuumb. It would be fine if it was just the premise that was stupid, but practically every development in this story raises some kind of plot hole. On top of that, the fact that the plot is centered around a person having been missing and perceived dead means the whole thing just feels too light for its subject matter. I’m one of the people who could never really appreciate the original song for that same reason. I could see this premise working as a dark comedy if it was handled a little more deftly, but as an innocent little kids cartoon it feels incredibly awkward. Normally, when I dislike something, I can at least count on one or two good performances to praise. Unfortunately, the voice acting, from the main character especially, is just obnoxious. It’s not unlistenable, but it feels way too much like no one got any direction. It’s probably telling that the biggest compliment I can pay the animation is that, for a T.V budget, it’s not despicable. It’s not actually good, though. Almost all of the scenes are just people standing around in a room talking, so there’s not really the expectation that animators would get to show off, but even then the optimal word is “lazy”. That same word perfectly fits the songs here, too. Not one is necessary, not one forwards the plot or characters, and not one is actually any fun to listen to. They’re all just distractions that come in and eat up screen time before they leave without ever being relevant. You know, normally when I hate something, it lets me go on a big old rant that I can have fun with. But this review is un characteristically short, mainly because my feelings toward this special don’t extend far beyond apathy. It essentially just takes an already needlessly morbid and annoying song, and plays it totally straight. It might be entertaining enough for the absolute youngest crowd possible, and I suppose it can be laughably bad at points, but for me, it’s a holiday tradition that I’m perfectly fine with skipping out on. Posted on December 7, 2014, in Movie Reviews, Other Movies and tagged Christmas. Bookmark the permalink. Leave a comment.